The Crystal of the Day for Thursday 26 September 2013 is Desert Rose. Deseret Rose Selenite is named for Selene, Greek goddess of the Moon because of its moon-like glow. Exchanged between lovers, it will bring about reconciliation. Some minerals form rosette shapes, and Selenite is one of these. 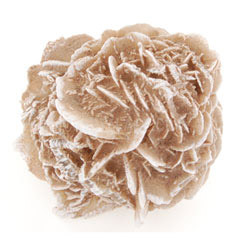 The Selenite rose rock is also called “the desert rose”, and is often confused with the Barite rose. The edges of Selenite rose are sharper and the crystalline structure is less hard than the Barite rose. Some desert rose metaphysical properties are mental clarity, increased awareness of self and environment; allows one to see inner truth, promotes success in business, helps one to access angelic guidance, quickly unblocks stagnant energy, instills a deep peace, and assists in accessing past lives.